An adorable new real money online slot game featuring cuddly pets, has just arrived in all its cuteness at Slotland. the first thing you'll do when you start playing Fluffy Paws is pick a pet – Bunny, Kitty or Puppy -- to determine which of the game’s various bonus features you'll encounter. Until August 16th, introductory bonuses include a $10 or $20 freebie and up to 125% deposit bonuses. Choosing your bonus opportunities by picking a pet to play along with adds an element of playful fun to the game. If you choose the Bunny as your pet you will get 10 free spins when a hungry bunny catches and eats a carrot. If Bunny falls in love, you’ll win 5 spins where all wins are doubled. Kitty Bonuses include 8 free spins when Kitty chases a mouse and an Expanding Wild that lasts 5 spins. In Puppy’s Dig It Up Bonus Game, Puppy has to find a bone hidden by the neighbor’s dog. Up to $20 freebie and up to 125% deposit bonus available until August 16, 2017. 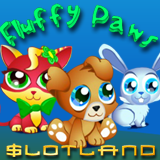 Until Wednesday, Slotland will give you a freebie to try the new Fluffy Paws slot game. A choice of introductory deposit bonuses with various wagering requirements is also available until then. 20X wagering requirement, 8X max. cash-out (VIPs 15X). Valid for Fluffy Paws only. 21X wagering requirement; valid for Fluffy Paws only. 13X wagering requirement. May be claimed twice a day. 10X wagering requirement. May be claimed twice a day. Valid for all games. Until now, Fluffy Paws has been available only at WinADay Casino, Slotland’s partner site, where it’s been one of that casino’s most popular games.